It’s pretty likely that if you’re here at this blog, reading this post, that you have a special fondness for tattoo. I know how you feel. Yet despite my own love for tattoo, one thing that really pleases me and takes me to that next level of tattoo happiness is when I see people doing something different with their tattoos. At this point, you might be tempted to scoff and say “There’s no such thing as a different tattoo anymore. Everyone has everything.” I disagree. Writing about tattoo provides me with the opportunity to really see what’s out there and learn who’s doing what. One thing that I can tell you, there’s arguably more going on with tattoo right this very moment than there ever has been. Some might see that as a bad thing, but I like to see change (as long as it’s good and positive). I have to admit that seeing a parent get one of their children’s doodles as a tattoo is not something particularly new to me. I don’t feel it’s reached the point yet however, where it’s entirely common and therefore there’s still something quite unique about it. What I haven’t seen until now is a parent getting tattooed with an ongoing series of their children’s doodles and even having their child help out with the tattooing. 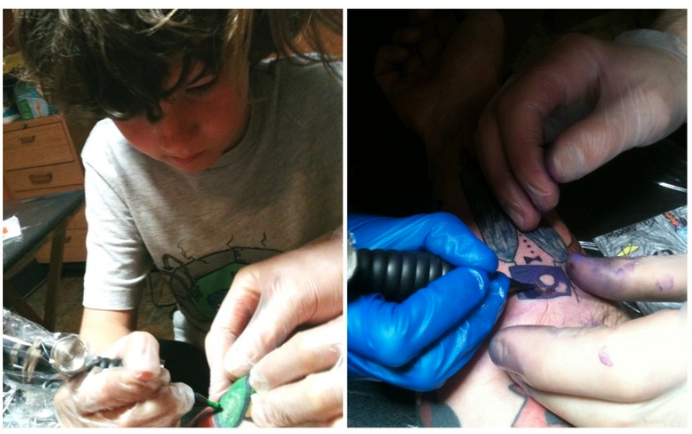 Keith Anderson began getting tattooed with the his son Kai’s drawings when Kai was four years old. 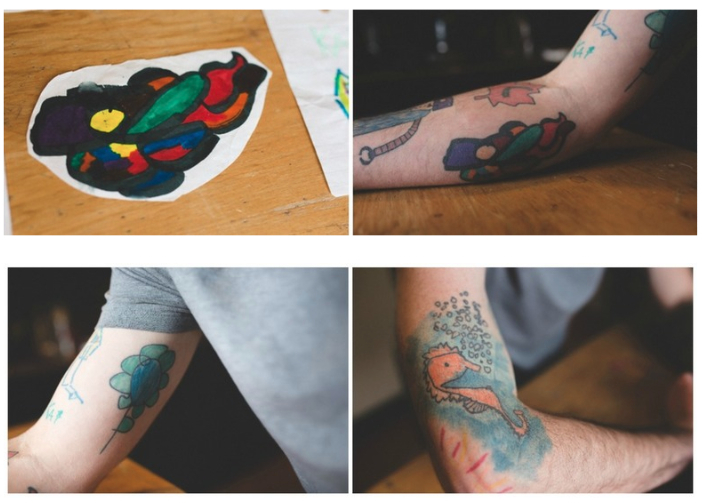 Every year, Keith selects a drawing and has it inked on to his flesh. He’s had three different tattoo artists aid thus far in this artistic and nostalgic pursuit. And yes, Kai has actually helped out with the work on his dad, though to what degree, the article does not say. I’m not really sure of the legalities of having a child tattoo his dad, but I mean, if Keith wants his son to contribute directly to the artwork a little, then so be it. I’m sure Kai wasn’t responsible for tattooing his father entirely from beginning to end. I think the best thing about this is how Keith can take a part of his son’s childhood and physically add it to his own life and body. By getting tattooed with Kai’s drawings, Keith will never be without the reminder of Kai and the impact of this on his life. Kids grow up fast and there aren’t many parents out there who are able to have such a lasting memory of that time when their child was a child. Good on you, Keith and best of luck with the tattoo collection!